Modern Material Handling reports, Unit sales continue to climb and revenue is inching upward in this year’s annual look at the top lift truck suppliers. Toyota Material Handling North America has again claimed the No. 1 spot on Modern’s annual list of the Top 20 lift truck suppliers, as KION Group held second place with nearly double the revenues of third-place finisher Jungheinrich. Although the combined value of the list grew less than a percent, 2015 was a good year for lift truck sales. While several companies appear to have reported lesser revenues, many also reported growth in unit sales as well as net revenue increases in local currency before conversion to the relatively strong U.S. dollar. Brett Wood, chairman of the Industrial Truck Association (ITA) and president and CEO of Toyota Material Handling North America, says the global lift truck market and the broader materials handling industry continues to be relatively strong, reflecting strong economies particularly in North America and Europe. In fact, several countries recorded lift truck sales at all-time high levels. Wood says the most significant observation from the sales data in 2015 is the growth of electric lift trucks and the decline of internal combustion (IC) models. Electric models in Class 1, 2 and 3 combined grew by 8% over 2014, whereas IC models in Class 4 and 5 declined globally by 10% compared to 2014. Even more significantly, Wood says, electric lift trucks jumped from 55% of the global industry in 2014 to now making up 60% of the global orders. Toyota Material Handling North America added more than $630 million in revenues, comfortably passing the $8 billion mark after an 8.2% increase in revenues ($8.35 billion) and a 7.6% increase in units sold (239,000). The figures reflect the forklift business of Taiwanese manufacturer Tailift, which Toyota acquired in late 2014. In second place, KION added 6.5% for a total of $5.66 billion after introducing a new brand to North America in 2015 and acquiring Egemin Automation, a manufacturer of automatic guided vehicles. Its North American brands now include Linde, Still, Baoli and Egemin. Crown Equipment reported nearly 6% higher revenues for 2015 and reclaimed fourth place after three years at No. 5. At $2.64 billion, Crown surpassed Hyster-Yale by $62 million. 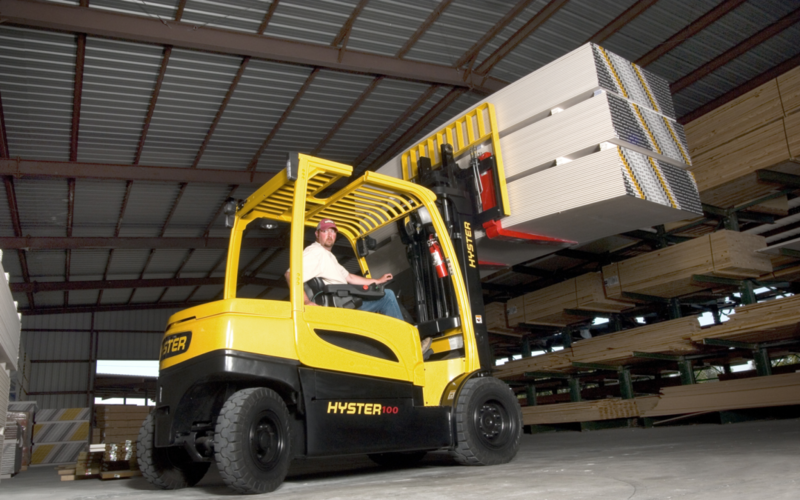 In fifth place, Hyster-Yale‘s unit sales fell by less than a percent to 86,900, contributing to a 6.8% decline in reported revenues that the company attributed largely to the strength of the dollar in 2015 as compared to 2014. In addition, a statement explained that revenues in the Americas declined partly as a result of a shift in trucks sold from higher-priced Class 5 trucks to lower-priced Class 3 warehouse trucks. In early 2016, Hyster-Yale announced the acquisition of Penta Holding, the majority holder of Bolzoni S.p.A., a leading manufacturer of forklift attachments. Mitsubishi Nichiyu, which includes Cat Lift Trucks, retained sixth place after revenues decreased by $147 million, or 6.8%, to $2.01 billion. However, a statement from the company clarified that 2014 revenue included 15-month results for some overseas subsidiaries, whereas 2015 revenue reflects 12-month results according to the unified fiscal calendar starting April 1 and ending March 31. The company also reported a 4.4% increase in produced units for a total of 60,752 units in 2015. No. 8 Anhui Forklift, makers of the Heli brand, shipped 74,392 units in 2015, a decrease of 10%, which contributed to a 19% fall in revenues to $907 million. In 2015 the company launched a second brand, CHL, which it says is intended mainly for the emerging market. After several years in seventh place and with revenues exceeding $1 billion,Komatsu slipped to 10th place last year. The company is now No. 9 as revenues fell a further 15% to $760 million. Hangcha, the Chinese manufacturer of the Hangcha and HC brands, dropped out of the Top 10, shedding three positions in the ranking after a 27% drop in revenues. This made way for Clark Material Handling to break into the Top 10 for the first time in the history of our list. The South Korea-based Clark earned level revenues, but reported expansion and investment in the last year. The company expanded its Lexington facility and added several electric models, a new reach truck, a new Class 3 straddle stacker, new patented masts and various ergonomic redesigns. “Clark continues to invest in product and production with significant investment in North American manufacturing, as well as hiring additional engineering support for research and development in North America,” according to a company statement. Shake-ups in the lower half of the list Following a 3.4% revenue bump to $706 million, Doosan rose to 11th place after several years as No. 13. In 13th place, Hyundai Heavy Industries was unable to report 2015 revenues by press time. Combilift, following a 13% increase in units and a 12% bump in revenues, claimed 14th place with $212 million. It continues a steady march up the list after nearly doubling the revenue that earned it 18th place in 2010. After breaking ground on a new $45 million manufacturing facility in Ireland in 2015, the company now has a dedicated warehouse design department that offers free design services to potential clients. Lonking fell one spot to No. 15 with $163 million after a 5% reduction in units sold, at 20,106. In 16th place, EP Equipment, manufacturer of Big Joe Forklifts and a newcomer to our list, reported entirely organic growth of more than 18% after selling 19,000 units in 2014 and 24,000 in 2015. Sang Tian, vice president at EP, attributes the growth to continued innovation, especially in Class 2 and Class 3 products, as well as additional penetration of key international beverage accounts. Hystu was unable to report 2015 revenues by press time, but its 2014 placeholder revenues were enough to move it up one spot to No. 17. Hubtex, a German manufacturer of special purpose vehicles including electric multi-directional sideloaders, diesel or LPG four-way sideloaders, reach trucks, order picking and glass transport systems, reported level revenues and landed in 18th place. Brazilian manufacturer Paletrans Equipment, No. 19, was unable to report revenues by press time. At No. 20, India-based Godrej & Boyce earned $67 million in revenues, down 11%. To be eligible for Modern’s annual Top 20 lift truck suppliers ranking, companies must manufacture and sell lift trucks in at least one of the Industrial Truck Association’s seven truck classes: electric motor rider; electric motor hand trucks; internal combustion engine; pneumatic tire; electric and internal combustion engine tow tractors; and rough terrain lift trucks. Rankings are based on worldwide revenue from powered industrial trucks during each company’s most recent fiscal year. Revenue figures submitted in foreign currency are calculated using the Dec. 31, 2015 exchange rate. The Worldwide Industrial Truck Statistics (WITS) organization tracks quarterly and monthly statistics on lift truck sales, and is compiled by six trade groups based in North America, Brazil, Japan, Korea, Europe and China. According to the 2015 WITS figures, global orders increased by a little more than a percent. Following a nearly flat year, orders and shipments to Europe spiked in 2015, up 9% and 7% respectively. Europe has again enjoyed the largest growth with a year-over-year increase of 8% and reaching more than 370,000 orders in 2015. The America’s region has also continued robust orders with 4% growth over 2014 and reaching an alltime high of more than 270,000 orders. The Asia region accounts for 40% of global shipments and is still the largest region with around 410,000 orders. However, following two consecutive years of 10% growth, Asia is down 6% from 2014, when it recorded more than 435,000 orders. Brett Wood, chairman of the ITA and president and CEO of Toyota Material Handling North America, says this is mainly due to the slowing economy in China and can be reflected in the decrease in sales of the top Chinese lift truck manufacturers ranging from -14% to -27%. In Oceania (Australia and nearby islands), shipments and orders finally rebounded after falling more than 20% in two years from 2012 highs. The Industrial Truck Association (ITA, indtrk.org) has defined seven classes of lift trucks, or forklifts, which are defined by the type of engine, work environment, operator position and equipment characteristics. Class 7: almost exclusively powered by diesel engines with pneumatic tires, these units are suitable for rough terrain and used outdoors. Since primarily classes one through five are used in materials handling applications inside the four walls, Modern has only specified those on our supplier table.